We started the morning off with another 5:00am wake up call. Ouch. However, having gone to bed at the ripe hour of 8pm and still on our gorilla high, the alarm sounded a lot less like torture and more like a peaceful nudge. To be honest, Brian and I didn't even know we were doing a golden monkey trek until we arrived at the lodge. We also went on a hike up to Twin Lakes the day we arrived, I guess it was a two night three day package, but since the stars of the show were the gorillas, we didn't pay much attention to the rest. We really didn't know how anything would top what we had just experienced and in truth, the golden monkeys do not compare, but that's not to say it wasn't enjoyable. The day started off very similar with coffee and tea, and entertainment at Volcanoes National Park HQ. 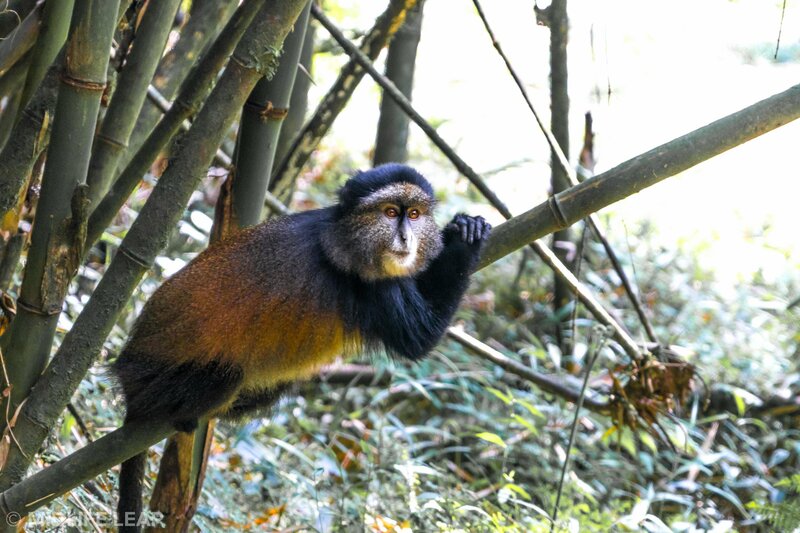 Unlike the gorillas, there isn't a limit to the size of your group for golden monkey treks. Thankfully the drive was an easy twenty minute ride back in the direction of our hotel. Tim told us we would be back at the lodge by noon at the latest. This was music to our ears since the day before we didn't return until close to 5pm, missing lunch all together (and we all know I don't enjoy missing meals). A hike around twin lakes. We met some awesome people during the trek (Hi Stacey & Amanda! Can't wait to hear about Uganda!) and heard inspiring stories of other folks who traveled for extended periods of time in their earlier years. 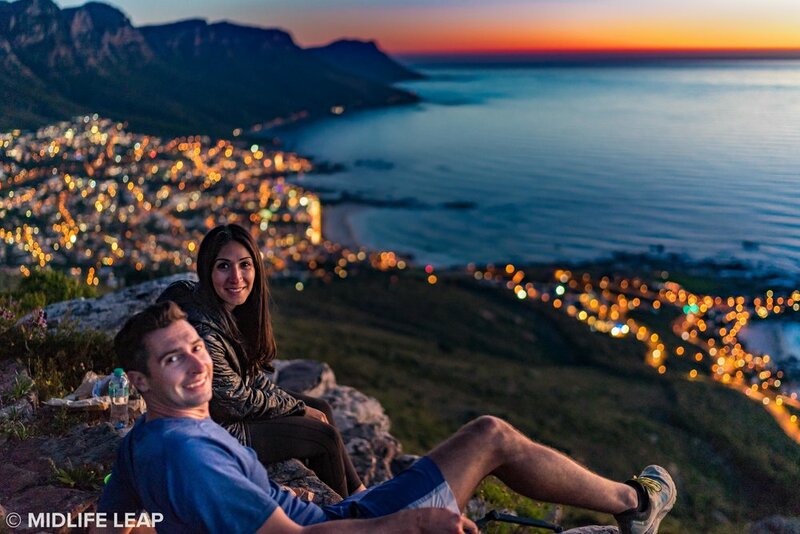 This is one of the many aspects of travel that I love, the people you meet along the way. The universe has a funny way of delivering exactly what you are seeking. Anytime the "selfishness"of travel started tugging at me, the world shifted and I knew I'm was exactly where I was meant to be. The experience with the golden monkeys is completely different than the gorillas. As I mentioned earlier, the trek is flat and short. You enter the park and are instantly transported to a green, tranquil bamboo paradise. The only thing to fear is the likelihood of getting peed on by a rambunctious monkey swinging in the trees high above your head. They are sneaky like that! 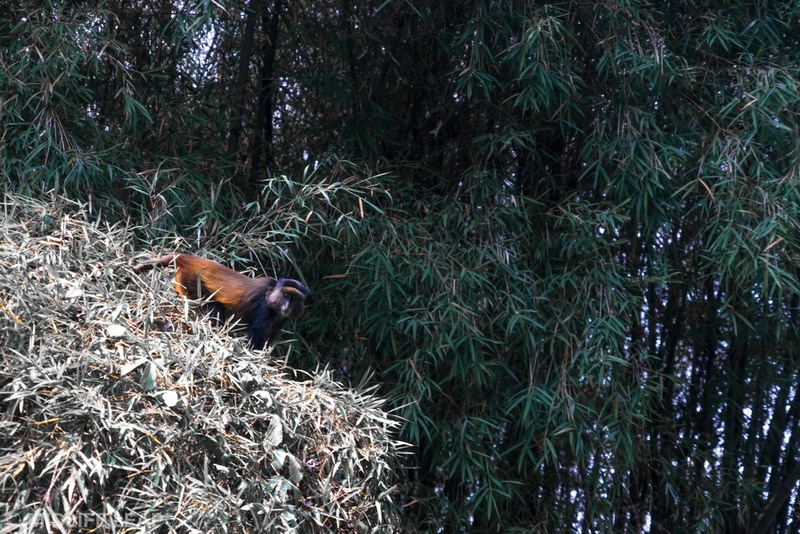 You find yourself looking in all directions in search of their amber, golden fur and before you know it a pack of them are fiercely climbing the bamboo as if it was a race to the top. The only similarity is that the trek is limited to an hour of viewing for the same reason of wanting to keep the animals safe in their natural habitats. Whereas with the gorillas every other phrase (other than "damn you nettles!") was "oh my gosh," and "I just can't believe how close we are," with the monkeys it was always, "they are so cute!" and maybe a little of "Brian can we please keep one!" Capturing these guys on film was a different story. They are basically the Usain Bolts of the bamboo forest. The hour seemed to go by much faster than the previous day, and as promised, we were back at the lodge in time for another lunch of, you guessed it, Irish potatoes. After three adventurous days and two glorious nights, we said goodbye to everyone at Mountain Gorilla View Lodge and packed up the cruiser for the two and a half hour drive back to Kigali with our trusty crew, Tim and Cyrus. We checked back into Heaven Boutique Hotel, had our first go at laundry in the bathroom sink (85% successful), and set out to eat dinner at a local restaurant. No more potatoes! After a few recommendations from Tim, we decided to check out Chez John since we were told it was walkable from our hotel. The only problem was that we couldn't find it on the map and neither could anyone else. Hmmmm. We were able to scrounge up some pretty vague directions. Something in the vein of, "well if you make it to La Gardienne supermarket, anyone there will be able to point you in the right direction." Okay, I guess. It's pitch black outside, and we have a 50/50 shot of making it to the supermarket while trying to remember hand gestures of turn left and then turn right, or was it turn right and then left? Then we have to rely on our luck that someone speaks English and knows where the restaurant is!? Brian's answer to everything, including this was, "we'll figure it out" and that we did. We made it to the supermarket (victory!) but, no one spoke English. Brian attempted to parlez vous français with a couple people, but sadly he wasn't successful. We continued down our ambitious journey, popped into a couple more stores and were about to give up when finally a kind young security guard overheard us trying to spell out Chez John with our dramatic hand gestures and pointed us down the street. We were basically standing in front of the restaurant. Yes! We found it! And it only took 28 people to help us. The restaurant was empty. Not a good sign but we weren't turning back. Brian ordered a questionable chicken dish (I'm sure it was fine, I'm just always suspicious of chicken dishes these days after my bout of food poisoning and of course the chicken feather incident), and I went straight for the grilled fish. The waiter had to warn me that my order was a whole fish: head, tail, and eyeballs, and it delivered on all fronts. Thank god it was delicious, because a mere two hours went by before we even saw the waiter again. You know how you always joke that someone went out to catch your meal if a restaurant is taking too long? Well I think they really did. While we waited, and wondered, and waited some more, the restaurant started filling up and we were the only tourists there. Success! The dinner, despite its extensiveness, was the perfect way to end our time in Remarkable Rwanda. We left the next afternoon wishing we had factored in one more day to soak it all in, but instead, we headed to the airport on our way to our second country, Ethiopia. See you there! Several people have asked about the lost luggage. We got it back! But, not after what could have been a huge disaster. It was pretty much a guarantee that the bag wasn't going to make it after nearly missing our connection in DC, so we knew as soon as we landed in Kigali one of us would go wait in the lost and found line (picked up that trick from the always resourceful Lindsey Viens!). I guess sometime between landing in Kigali and driving to the Volcanoes, Brian forgot we were in Africa. He figured he could just take a picture of the claim ticket and throw the physical one away. He figured, that similar to SF, everyone loves technology right? Wrong. We factored in an additional thirty minutes or so before our flight to Ethiopia to get the bag. It should have been easy. We called, they had the bag (and made fun of it), we arranged to keep it at the airport and pick it up on our way out, and we had the claim ticket (or so I thought). I asked Brian for the ticket so I could go get the bag (which by the way was giant and bright orange), and instead, he handed me his phone. Confused, I look at him and in more articulate words asked for the b-a-g-g-a-g-e c-l-a-i-m t-i-c-k-e-t. He told me he threw it away after taking a picture of it on Evernote. EVERNOTE!? I proceeded to tell him we weren't in SF anymore, and the ticket even stated in plain English that there are no substitutes. You must present the physical ticket to retrieve your bag. Once again Brian voices his, "not a big deal, we will figure it out" nonsense, and I send him in instead.